While wine contains carbs like many grape derived products, your body processes them differently than non-alcohol containing beverages. If you count carbs, you may be surprised at just how many carbs there are in a glass of wine. When most people think carbohydrates, they think of foods that are starchy or drinks high in sugar content. Wine actually contains no starch and very little residual sugar. 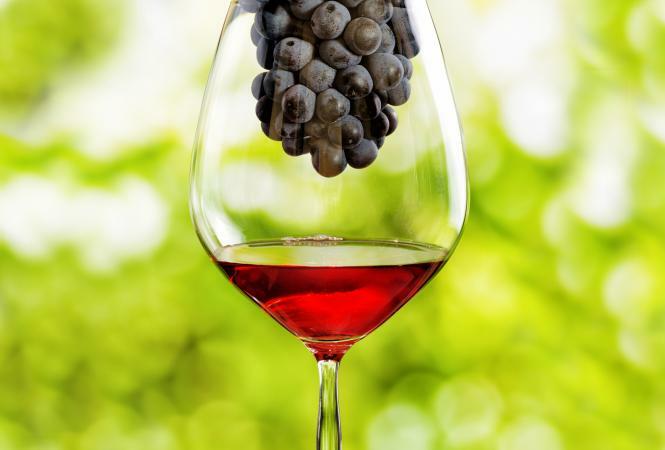 The natural sugar that occurs in grapes is converted to alcohol during the fermentation process. There are not technically carbohydrates in wine, but what nutritionists and other scientific foodies like to call "carbohydrate equivalents." In fact, the USDA refers to the carbs found in wine as "Carbohydrate by difference." This means that carbohydrates are not detected in the food; they are what remain after fat and protein have been detected, accounted for and removed from the equation. These "carbohydrate equivalents" have to do with how the body metabolizes the drink. Wine contains alcohol that is processed in the liver. Your liver converts the alcohol into acetate, which is a type of fuel the body can use like carbohydrates, fat or protein. Your body burns the acetate first, before other fuels, turning it into energy before it ever gets a chance to turn into fat. So while you may want to count carbs with each glass of wine you drink, keep in mind that these carbohydrate equivalents, particularly in red wine, may actually lower your blood sugar, rather than sending it into a spike. People with diabetes should continue to count the carbs in the wine as normal, because consuming too much may have an adverse effect on blood sugar levels. As a general rule, the bigger bodied the wine, the higher the carb count. The lighter bodied the wine, the lower the carb count. Always check the label or call for nutritional information about any wine before consumption, if you are concerned about the carb counts. While every glass of wine may contain some carbs, the jury is still out on exactly how those may affect you. Some red wines may lower your blood sugar, while drinking excessive amounts of wine may raise the blood sugar of some diabetics. If you count carbs for health reasons, remember that wine contains a moderate amount of carbs and as such, should be enjoyed in moderation.